Why MS started this programme? The training given at the MS Olympias 40 also prepares students for the national level competitions and equips them to crack the IIT and medical entrance examination confidently thereby clinching a seat for them in prestigious institutions of the country. On critical analysis it was found that the competition for IIT and the like has toughened so much that 2 years are not sufficient for the students, no matter how good the students are and how hard we try. In order to boast student’s self confidence and raise their self esteem and also to meet the needs of the community, MS devised a long term strategy of starting MS Olympias 40 with integrated Olympias programme from 8th standard so that we start our efforts early. Why to start this from class VIII? Direct supervision of experts for individual attention and greater percentage of success. We aim to design this course in such a way that every subject is taught from Islamic Perspective. Students should understand how Islam deals with each modern topic, what contribution Muslims made in the development of that topic and how we can correlate/implement it in this age. The students should learn and get inspired from the lives of our prophet, sahabas and Muslim heroes. Be it their strategy, their leadership, their quality, their simplicity or magnanimity, there is a lesson to learn and lead this world. They must learn the subjects of History, Science and Maths from Quranic view of point and apply Social studies handling situations like Law and Order, Justice, Governance etc. from Quran, Hadith, Sunnah and Seerath of Sahaba. Alongside, we plan to make it a skills based course. These students must be good in communication skills especially English as it is a global language and an easy medium to reach and preach in our community throughout the world. They must be computer literate and be practical in using computers for planning, designing, accounting, team building, presenting, conducting a meeting, reporting, managing and more. They must be able to design business processes, flow charts, and reverse engineer a concept or a business model in order to learn from successful Entrepreneurs and Businessman. They must acquire all the skills a student in B-school would learn throughout the course. They must be excellent in life skills and soft skills like Body Language, Public Speaking, Public Relations, Selling/Marketing, Time Management, Memory Techniques, Mind Mapping, Problem Solving, Decision Making, Risk Taking and more. Above all, they should be confident and enthusiastic so much so that they can take up any role or start up their own business after graduating from this course. They must know how to deal with people especially with people of other communities and develop cordial diplomatic relations with one and all. That’s one of the Sunnah of our Prophet. Each child is a winner is the slogan of this initiative. Curriculum is the sum total experience of a child in a school right from the moment he enters the School till he leaves the campus. We plan to design a customized curriculum for each student. Though there are some mandatory tasks, subjects and activities, the course of the curriculum will be as per the capacity and grasping power of the child. The basic program includes stress free gradual foundation course every year from June to December followed by Scholastic studies of the respective class. Though integrated, this program would focus more on the Olympias side in the beginning and then gets tailored to address the examination of the respective class near the end of the academic year. Realization workshops to help them identify their identity and set firm goals for self, family and community. Through screening test organized with collaboration of concerned Muslim organizations and individual followed by Technical and Psycho Analytical interview. Location: Various centers in Hyderabad and districts of Telangana. 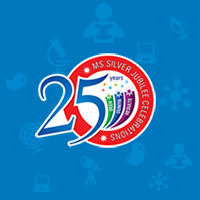 MS plans to partner with schools who would utilize the facilities and efforts of MS Olympias 40 while retaining their students on their rolls. They shall study in MS but officially enrolled in their own school thereby promoting collaboration.